Trigger Warning: Short Fictions and Disturbances, Neil Gaiman's latest short story collection, reminds us that behind all the touring, the shareable writing quotes, and the Twitter omnipresence, Gaiman is not only a good writer but a great one. Like other major English writers of the fantastic, such as Douglas Adams, Terry Pratchett, and Algernon Blackwood, Gaiman has a particular way of using the language, one that relies on very specific phrasing, intensity, and precision. He uses language not to shock but to unsettle, and throughout this collection his distinctive voice envelops the reader in a terrifying darkness that nonetheless feels somehow wholly right. That precise use of language is important when considering the collection's controversial title. Gaiman has taken some flak for calling the book Trigger Warning, invoking the wording often used on social media to denote potentially upsetting content. 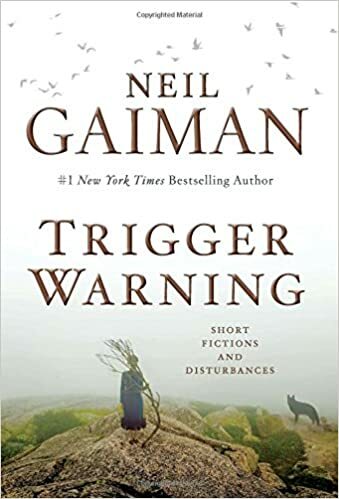 As Gaiman explains in the introduction, "I was fascinated when I learned that trigger warnings had crossed the divide from the internet to the world of things you could touch," referring to colleges putting trigger warnings on texts, something he found himself "simultaneously warming to . . . while being deeply troubled by it . . . I wonder, Are fictions safe places? And then I ask myself, Should they be safe places?" In the introduction, Gaiman writes of stories he read as a boy that "troubled me and haunted my nightmares and my daydreams, worried and upset me on profound levels, but they also taught me that, if I was going to read fiction, sometimes I would only know what my comfort zone was by leaving it; and now, as an adult, I would not erase the experience of having read them if I could." With that mindset, and wondering if anyone would put trigger warnings on his fiction one day, Gaiman "decided to do it first." The writer Kameron Hurley has rebutted Gaiman’s comments on SciFiNow, declaring that Gaiman simply defines "Little triggers" as "things that 'upset us.'" Pointing to the term’s origins in online feminist academic circles, Hurley writes of how "[t]rigger warnings were designed to prevent people who have post-traumatic stress flashbacks from reading material that would trigger that stress . . . The problem with mainstreaming [her view of Gaiman’s use] of the term . . . is that your work becomes part of the problem of breaking it down into meaninglessness and slapping it on any old thing as a marketing gimmick." Hurley argues that Gaiman’s supposed redefining of the term is "irresponsible." While Hurley's concerns are entirely valid and provide a much-needed alternative perspective, Gaiman’s text suggests that he sees his use of the phrase differently. Right after the portion of the opening cited by Hurley, Gaiman explains "That’s not quite what we’re talking about here, though. I'm thinking about those images or words or ideas that drop like trapdoors beneath us, throwing us out of our safe, sane world into a place much more dark and less welcoming." In later bringing up an example of a female friend of his who is terrified of tentacles, Gaiman is not mocking but instead empathetic. Also worth noting is that the introduction is Gaiman’s longest yet, showing that he knows what he's getting into with the title and is taking great care to justify his use of the phrase. As befits the subtitle "Short Fictions and Disturbances,"” the stories, are, well, disturbing. The arch "Pearls: A Fairy Tale," about a girl whose stepmother gives her drug money, is unsettling in the best fairy-tale tradition—disquieting but justly so. The Jack Vance-inspired "An Invocation of Incuriosity," about a boy from the end of the world and what he encounters in the past, reads like the work of a less dogmatic, more wondrous Robert E. Howard, while exposing the evil that fathers can do to sons. Winner of a Shirley Jackson Award in 2010, "The Truth Is A Cave in the Black Mountains . . . ," set in ancient Scotland and concerning a dwarf and the man he hires to take him to the titular cave, a legendary source of treasure, is impressive. The mystical undercurrent of the story, the narrative voice's aged melancholy, and the descriptive language, rolling in like highland fog, combine to create a story that'’s the closest anyone's come in quite some time to recapturing the spirit of the Grimm brothers. The story disturbs the reader because it shows the lengths men will go to for gold, for revenge, or to assuage their own guilt and sorrow. Gaiman also plays with icons of British culture, taking famous figures and putting his own indubitable spin on them, as he did with Morpheus in The Sandman. In "The Case of Death and Honey," an elderly Sherlock Holmes is tasked by his dying brother Mycroft with solving death because "“it is a crime as heinous and as monstrous as any of the penny-dreadful massacres you have investigated." As a result, Gaiman sends Holmes to China, and to a meeting with the taciturn beekeeper Old Gao. It is the purest form of pastiche, meshing as it does the rationalism of the Holmes stories with the supernatural charge that infused Doyle'’s later writings, even if Holmes is here more sentimental as a person than he generally appears in the canon. Then comes Gaiman’s Doctor Who story, "Nothing O’Clock." Set in the revived Doctor Who's fifth season, Gaiman pits the Eleventh Doctor and Amy Pond against a disguise-adept creature called the Kin. It’s a story happily closer to the singular alchemy of his Hugo Award-winning Who episode “The Doctor's Wife” than to the rote nature of his follow-up episode, "Nightmare in Silver." It’s also the kind of creepy that a good Doctor Who story should be: it terrifies you, even though you know that the Doctor will save the day. Gaiman's empathy shines through in the collection’s big draw for longtime fans: the new story "Black Dog,"” the first story in nearly a decade about Shadow, the enigmatic hero of Gaiman's 2001 opus, American Gods. The story finds him in the cold, rugged hills of England’s Peak District encountering the titular ghost, a famous British horror (and incidentally a term used by Winston Churchill, among others, as a metaphor for the specter of depression, a meaning that Gaiman is wholly aware of, and exploits). Shadow finds himself rooming with a local couple, only to discover there's something dark hidden beneath their sunny exteriors, at which point he becomes determined to help them. In the end, the story, like the rest of the collection, shows what happens when disturbances linger and proves that the worst horrors are the ones we keep to ourselves. If we do that, Gaiman insists throughout this collection, we doom ourselves. It is only by letting others in that we can combat the darkness which seeks to sweep us away. Tom Speelman blogs at tomtificate and is a staff writer and reviewer for Another Castle and a contributor to Sequart . He’s currently writing a book on Star Trek and rants about that, comics, anime, cartoons, Transformers, and suchlike @tomtificate on Twitter.